Here we are, a new year. I’ve been remiss updating this blog but I’ve not been fully idle in my absence so allow me to update you to some of the exciting projects underway here at Deep Wood. I will not attempt to summarize In the Penal Colony, it’s a brilliant and important part of Kafka’s canon. But if you are curious here’s a wikipedia link. I am pleased to present this new previously unpublished translation by the acclaimed Breon Mitchell which will be lavishly illustrated with six etchings by Dellas Henke. This very limited edition is set at 30 copies divided between Dellas, Breon and myself and will be sold in sheets primarily. I will bind my third of the edition and also produce some presentation bindings. Dellas has been working on editioning the intaglio prints and is closing in on his end of the project while the rest of the paper lies here at the press waiting as I fuss with last minute layout adjustments. The book is large a format 10×13 inch (25×33 cm) page size with the text being composed in Janson and printed on Somerset Book White, 175gsm. The intaglio illustrations are “bled print” to the edges. 40 pages. $1000.00 unbound. Advanced inquiries and sales may be made. Here are some of the image proofs from Dellas, 10×13″ sheets. It should be noted that these are proofs – works in progress – and also were not printed on Somerset stock. Breon Mitchell has translated major works by Günter Grass, Heinrich Böll, Siegfried Lenz and other leading German authors. 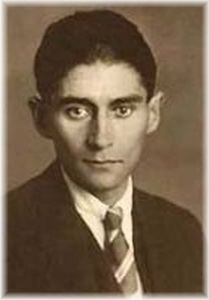 His retranslation of Kafka’s Trial received a special commendation from the American Translators Association. His other awards include the ATA’s Ungar Prize , the ALTA Translation Prize, the Kurt and Helen Wolff Prize, the MLA’s Aldo and Jeanne Scaglione Prize, and the British Society of Authors’ Schlegel-Tieck Prize. He is Director Emeritus of the Lilly Library and Professor Emeritus of Germanic Studies and Comparative Literature at Indiana University, Bloomington. Dellas Henke learned printmaking a S.U.N.Y. Brockport from Robert Marx. It was there that he saw his first artist’s books- collaborations Marx had made with the activist priests the Barrigan brothers. Henke continued his education at the University of Iowa where he worked with printmakers Mauricio Lasansky and Keith Achepohl and had the remarkable opportunity to learn about letterpress printing from KK Merker and Kay Amert. It was in Iowa that Henke first illustrated with etchings Samuel Beckett’s, “Waiting for Godot” – an edition sanctioned and signed by Beckett. Over the next few years there were further collaborations with Merker and the Iowa Center for the Book where Henke illustrated Beckett’s “Company” and H.D.’s “ Within the Walls and eventually making an illustrated edition of Beckett’s, “Ill Seen Ill Said”. In the intervening years Henke has been the coordinator for the printmaking department at Grand Valley State University where he continues to make prints, paint, and draw. Henke has been involved in more than 200 exhibitions and has been collected by dozens of public institutions. I would also be remiss mentioning that Dellas was my professor for printmaking in college long ago. Great to be working with him again and his visits north have been a lot of fun fishing, hiking around with his dog Lazlo and telling stories. Further, it is a thrill to be working with Breon on this project and a fortunate stroke of serendipity with my own project though rather mind bending to be working on two Kafka manuscripts at a time. Dellas, working on print arrangement for the book. My own Kafka project The Hunter Gracchus is also coming along but has been completely redesigned to a larger format. More to come soon with that progress. I sadly note the passing of Judith Minty in November. Judith and I produced her short Killing the Bear in 2011 with wood engravings by Glenn Wolff. In her 84 years I hope I amused her for at least one of them…. Use of the studio spaces and instruction can also be negotiated with a stay. Fully (and nicely) appointed letterpress and intaglio print spaces as well as a complete bindery. Visit my main website for much more information about the facilities here. Kafka, Dublin, Berkeley, Seattle and leather bits…. I wish I had some beautiful pictures of new work to add to this post but alas, sometimes running a business and being an artist has nothing to do with actually making art! Fear not, the pictures are coming soon. The most newsworthy part of “not actually making art” is probably the long negotiating process I recently concluded with a literary translator from the UK who I have retained to create a new rendition of Franz Kafka’s The Hunter Gracchus. Gracchus is a project I’ve been waiting on for at least a decade and after yet another round earlier this summer trying to secure rights to reprint from Schocken/Random House was a bust. I needed permission to reprint the original translated version by the husband and wife team of Edwin and Willa Muir in the 1940’s. I decided to look further into Kafka’s estate and was happy to discover that his works are now considered out of copyright in both the EU and USA – in the German anyway. Here’s where Jamie Lee Searle comes into the picture. There are more translators available for hire in the the EU for reasonable rates than the US, go figure, and most based in the US are busy academics so I had some research and inquiries to make before I could even approach someone I felt competent for the project. While I can’t read German I admired the breadth and selection of titles that Jamie has done and she is quite well regarded by her peers so I sent her an inquiry last October about the project. I am happy to say I will be getting the first drafts in the next few days and hope to have at least some prototype pages to show at Codex next month. I’ve recently acquired the matrices for casting the typeface Weiss in 4 sizes and with luck the Linotype will cooperate and give me 50 good lines as it is bitterly cold outside right now at 6º (-14 C) and it is difficult to convince any of these old cast iron and steel behemoths to perform well in these temps. I’ve also been working on a presentation binding for the last of the deluxe editions of The Heart of Darkness. This binding is for an exhibit at The National Print Museum in Dublin, Ireland which I am happy to be part of along with 24 other invited fine press printers from around the world. There are just a couple copies of this book left in the regular edition and this is the last of the deluxe copies for sale. A good run for a book that was finished 4 years ago and was probably the most fun project that I did in partnership with Chester River Press. I’ve been working on more presentation bindings/deluxe editions of my most recent books in preparation for the CODEX Book Fair and Symposium coming up in February 8th – 11th where I will be at my table full of Deep Wood Press books. There will definitely be pictures of unique bindings and books gracing this blog in the very near future as these projects near photo worthy stages so please stay tuned. ” Over 200 of the world’s most distinguished book artists and artisans, private presses, and fine art publishers will be exhibiting their work at the upcoming biennial CODEX International Book Fair. This is the largest book fair of its kind in the world today! There is no better place to find and collect the world’s greatest contemporary artist books, fine press books, and fine art editions than at CODEX. Now in it’s 10th year, CODEX has been acknowledged as the leading International Fine Press and Artist book fair. Exhibitors are coming from Germany, UK, Italy, France, South America, The Netherlands, Mexico, Israel, China, Austria, Poland, Australia, Russia, and Japan. The event also attracts special collections librarians, curators, and private collectors from all over the world. “This is THE place to see the latest work from ‘the best of the best’ “ states Peter Rutledge Koch, Founder of the CODEX Foundation. – see you in Berkeley at CODEX, come join the madness! I’ll also be teaching a workshop and giving a couple talks in Washington state immediately following Codex on February 12th – 16th. I am teaching a workshop for the Seattle Book Arts Guild on the 14th & 15th from 9:00am-5:00pm Reduction and Multi-block Color Printing with Linoleum Blocks for Letterpress at Pacific Lutheran University, Tacoma, see here for contact information. I’ll be giving a talk which will be an overview of the evolution of Deep Wood Press over the past 23 years for the Guild on the 12th and also at the University of Puget Sound on the 13th. I’ve admired the poetry of Terrance Hayes since a friend recommended him a couple of years ago so when I got word he was coming to my part of the world I took note, and made a few inquiries. I had done a broadside for Robert Hass when he came to Interlochen Center for the Arts in 2006 so had already set a precedence for the project to happen and they were very receptive. Then the game of working with an author and their publisher on a short schedule for selection and proper clearance began! 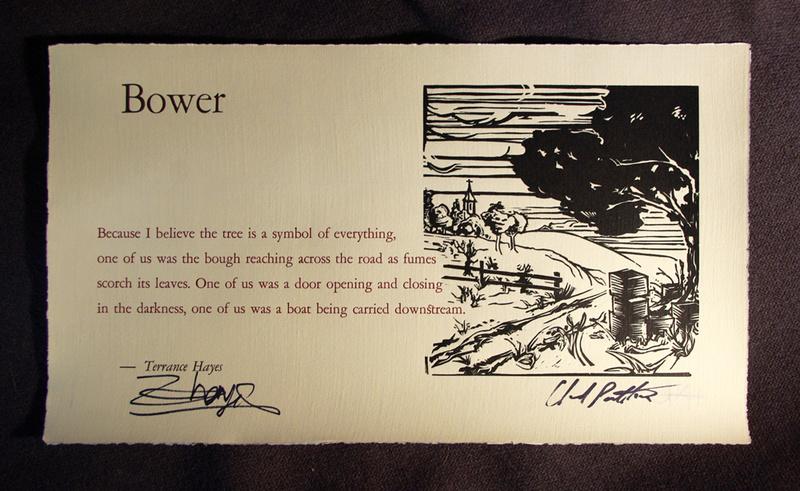 I was sent the piece Bower which is excerpted from the poem Arbor for Butch in the book Lighthead. I was familiar with the poem as a whole and struggled with what sort of art or ornamentation this fragment of a poem should/could have accompany it. In the end I decided to let these four lines of text stand on their own and this was probably influenced by the fact that I had a linocut I’d done but hadn’t used for anything “bookish” yet which fit well with the poem especially after hacking a bit off the top of the block. Also, time was short, I had to work with materials and paper I had on hand, no time to order anything in. So here it is as it turned out. Three colors on mould-made German Zerkall Frankfurt cream paper, 15 x 8.5 inches, hand set in Garamond in 24 and 72pt type and printed on my Vandercook 219OS with an additional bit of text on the back commemorating the evening and credits. The paper was not ideal, it is a beautiful sheet but the pronounced laid lines from the mould made printing the solids on the linoleum block quite difficult solved by being diligent with ink, a soft packing and running the sheet through the press twice. The Frankfurt paper was the only nice stock I had in enough quantity to do 100 broadsides so the dimensions of the broadside were more or less dictated by how the sheets could be divided and since it had such a lovely deckle edge from the mould, 100 is a small enough quantity to tear down by hand. From the beginning I planned on the text running into the linocut so had made paper cut outs of the proofed text and moved it around with prints pulled from the linocut to plan my composition. I printed the lino first but now, to my eye, I feel the text crowds the image and would have benefitted from being moved a bit further away but stubbornly decided to keep my left margin equal − these are the hazards of only having a couple of days to devote to something. I prefer to have various proofs just hanging around the studio for a few days or a few weeks to look at. It’s fast enough to put some ink on the slab bust out a brayer and tweak the print or play with word spacing in the type, add leading, move elements around and “play”. My approach on book and typographic composition comes from my fine art background first where typically a painting or print evolves over a period of time. Blocks of text are tones of color or shades of grey, how they work with whatever other non-typographic elements might be present and the space of the page spread and the overall book design. My early books were far more “experimental” with type I think but not always in a good way, so much forever to learn. I have an advantage, I think, in my book production because I do every part of the process here – I envision the whole of the book from the beginning from material selection to what the cover will look like. Knowledge of paper and bookbinding informs much information on creating the page layout and selection of stock for accompanying art, doing the artwork for the project gives me flexibility in design, and there is no reason why anything can’t change as the project progresses. this is analog design. this is letterpress. For those who don’t know, (taken from Wikipedia) Terrance Hayes first book of poetry, Muscular Music (1999), won both the Whiting Writers Award and the Kate Tufts Discovery Award. His second collection, Hip Logic (2002), won the National Poetry Series, was a finalist for the Los Angeles Times Book Award, and runner-up for the James Laughlin Award from the Academy of American Poets. He won the National Book Award for Lighthead. Hayes poems have appeared in literary journals and magazines including The New Yorker, The American Poetry Review, Ploughshares, Fence, The Kenyon Review, Jubilat Harvard Review, West Branch, and Poetry. In September 2014, he was honored as one of the twenty-one 2014 fellows of the John D. and Catherine T. MacArthur Foundation – one of the most prestigious prizes that is awarded for artists, scholars and professionals.